You are here: Home » MEDIA » Books » Vicious Rumer by Joshua Winning (book review). Vicious Rumer by Joshua Winning (book review). Rumer Cross is the orphaned daughter of one of the world’s most feared assassins. Her mother, Celene, stuck around just long enough to curse Rumer so that everyone she loves is doomed to die and then ran off and got herself killed. Yet someone seems to think that Celene left Rumer more than just a curse and now they’re hunting her down to get their hands on it. As Rumer struggles to stay one step ahead of the people who are targeting her, those she cares for and, there are precious few of them left, are placed in even graver danger than usual. It might finally be time for Rumer to confront her past if she and her friends are to have any hope of a future. 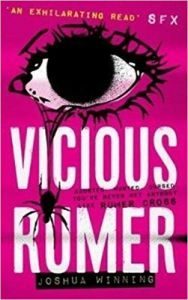 I was quite surprised to find that ‘Vicious Rumer’ is marketed as a YA novel. It has a tendency towards rather graphic violence and, although the protagonist is a teenager, it isn’t something I would want to give to anyone at the young end of the YA spectrum. Joshua Winning has created quite an unlikeable character in Rumer Cross and that’s no bad thing. In a world full of saccharine sweet heroines, it’s quite refreshing to find a central character for whom I have very little sympathy. Blaming all the bad things in life on the curse her mother placed on her at birth, Rumer slides from place to place, person to person, never getting close and treating those who care for her as little more than inconveniences. This is most evident in her relationship with Bolt, an ex-policeman who is now inexplicably acting as a kind of sidekick to Rumer, having left the force after a severe injury in the line of duty. The acerbic nature of Rumer does get tiresome at times, but it does make the few softer moments feel special, particularly when we see her with Frances and George, one set of the many foster parents she stayed with. The plot of ‘Vicious Rumer’ is a little far-fetched, starting with mobsters and a pit of death, adding in a good dose of bloody violence, sprinkling a dash of detective noir, a dollop of mythology and finishing with an off-the-grid commune in the woods. The ‘twist’ wasn’t particularly surprising and I have to admit I barely raised an eyebrow at the big surprise reveal. I’ll not put in any spoilers, but the character didn’t feel overly shocked to discover a big secret either. In fact, I think that what was lacking was a bit of emotional involvement between the characters and the action. It became rather two-dimensional at times, with very little depth developed in most of the characters. I’d have liked to see more of Bolt and the mob characters, particularly Mara, who seemed to flit in and out of the action almost by accident. I finished this book very much in two minds about it. There were definitely points I liked and I think there’s potential for future stories involving Rumer that would allow the addition of further character depths to the supporting cast. However, I think it fell a little short on the plot and, for a standalone novel, though the author says he might consider writing more about Rumer in the future, it needed a little bit more oomph to really carry it off. Worth a read, but not one that will be shooting to the top of any of my favourites lists. « The Point by John Dixon (book review).